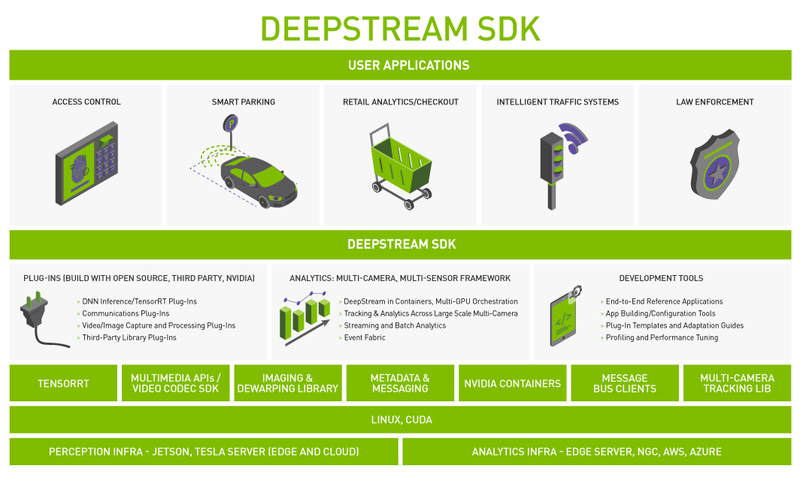 NVIDIA today announced the software release of DeepStream SDK 3.0 for Tesla GPUs. Developers can now focus on building core deep learning networks rather than designing end-to-end applications from scratch given its modular framework and hardware-accelerated building blocks. The SDK’s latest features make it easy for you to create scalable solutions for the most complex Intelligent Video Analytics (IVA) applications. This includes new plug-ins, support for 360-degree cameras, application deployment in Docker containers, and pruned and efficient model support from NVIDIA’s Transfer Learning Toolkit. Building situational awareness or extracting business insights from video is a multi-step process, starting with perception. Each camera stream is processed for scene understanding — including its constituents, their attributes, and actions — in the form of metadata. This metadata, while extremely rich, only shows the camera’s perspective for that point in time. To build a global view across cameras, all the metadata from the perception process needs to be analyzed together to understand long-term behavior and patterns, identify anomalies and draw business insights. More developers are turning to AI to process video because it delivers significantly better performance than today’s inflexible and monolithic solutions, which are designed for specific applications and deployment conditions. A framework to develop highly flexible applications and the ability to deploy in containers to improve system manageability. New plug-ins to connect the edge to the cloud through message brokers for analytics with custom deployments based on Spark or by using IoT services. Pruned and efficient model support created by NVIDIA’s Transfer Learning Toolkit to tightly pack complex applications for high throughput and stream density. It also introduces support for the NVIDIA Turing architecture, dynamic stream management, multi-GPU processing, dewarping capabilities for processing 360 degree cameras and a number of plug-in enhancements. Our latest software can be used in a variety of applications, including retail analytics, automated optical inspection, freight and goods tracking, ad injection, and more.